Hortus Camdenensis | Spiraea corymbosa Raf. 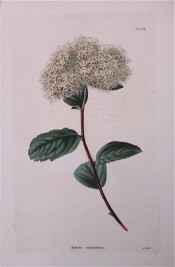 Fully-hardy, sparsely branched shrub with broadly elliptic leaves, to 7.5cm, often serrated at the tips, and rounded corymbs of white flowers. To 1m. [RHSD, Hortus]. ‘This plant has been lately introduced, and is believed to be a native of North America. It is a hardy shrub, of low growth, and flowers very freely in the beginning of summer, the blossoms continuing in succession for a considerable time.’ [LBC no.671/1822]. Introduced to Britain in 1819. [JD]. Don. FS f.1097/1856. Listed in all published catalogues [T.929/1843]. Spiraea corymbosa Roxb. (1814) = Spiraea roxburghiana N.Wallich, synonym Spiraea cantoniensis Lour. More details about Spiraea corymbosa Raf.